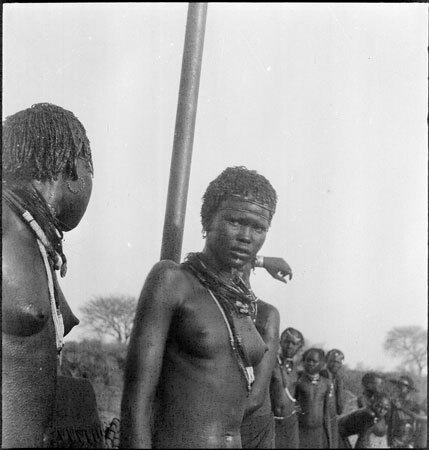 A Dinka girl in a line with others at a dance gathering, wearing numerous bead and giraffe-hair strings, standing next to the tall metal post seen in other images of this event. Morton, Chris. "Dinka girls at dance gathering" Southern Sudan Project (in development). 03 Jan. 2006. Pitt Rivers Museum. <http://southernsudan.prm.ox.ac.uk/details/2005.51.358/>.